The One Station Tablet Press is a perfect solution for small manufacturing or R&D purposes where small amounts of tablets or samples are needed for trials. Thanks to its small size and weight, the Minipress is best suited for the tightest of working environments. 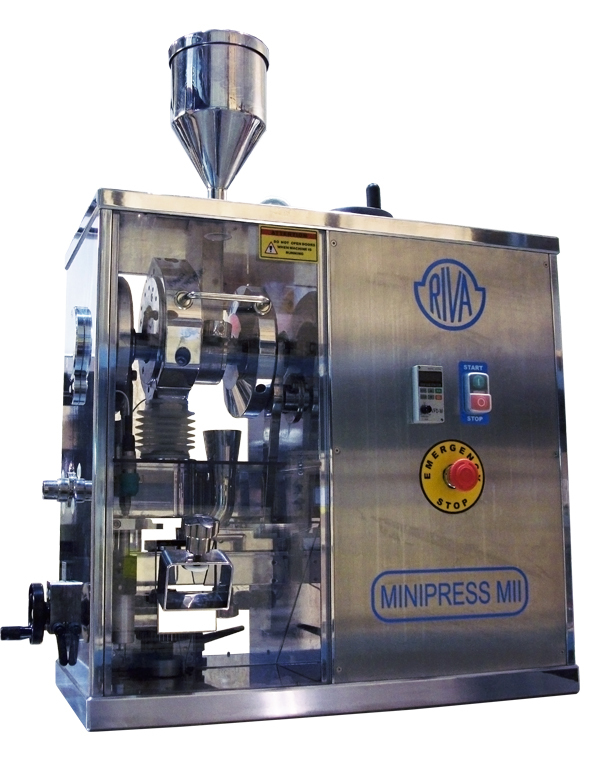 Featuring a 6 Ton (55kN) compression force, the Minipress can produce low volume production runs for R&D operations. It allows adjustment of tablet dimensions to fulfill production requirements without the loss of expensive granulate and without taking the time of industrial tablet presses for testing. The Minipress is table top mounted, simple to set up, operate and adjust. 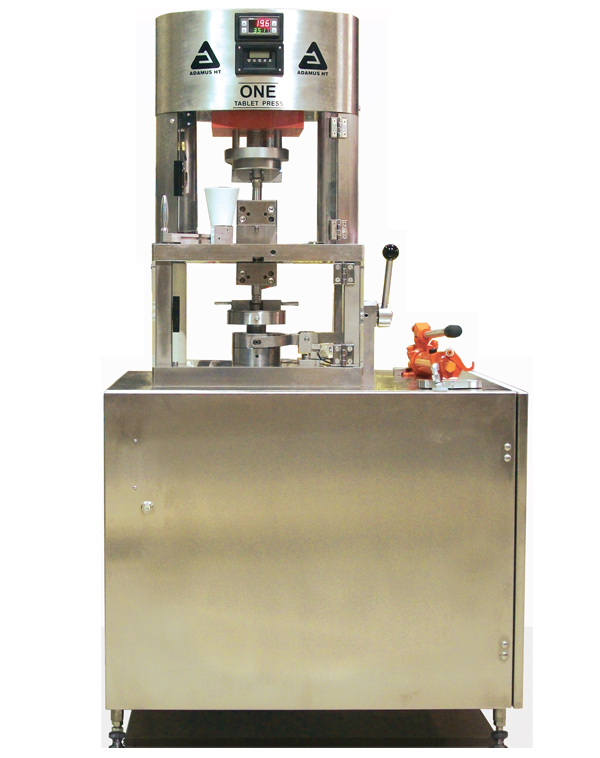 It is a single punch eccentric tablet press which is designed specifically for small scale development of tablets. "The Director" instrumentation system features include work curves, Heckel plots and porosity curves as well as compaction profiles and strain rate studies. 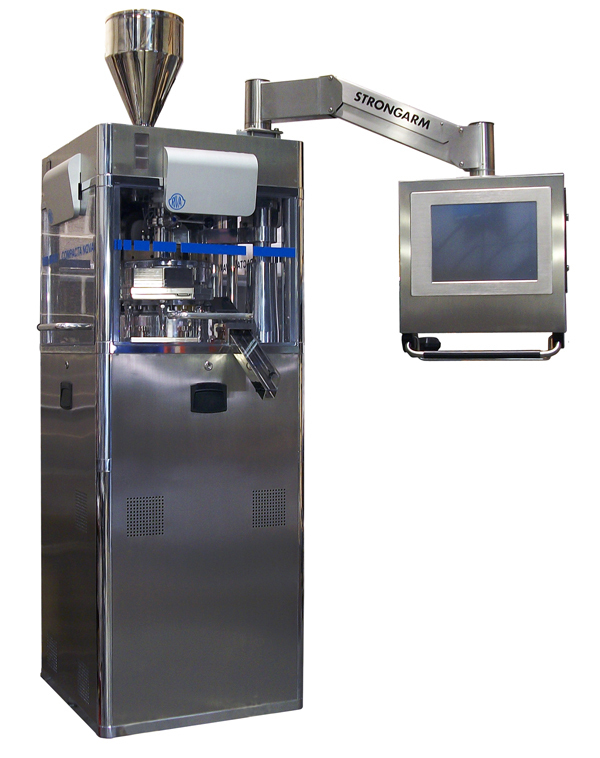 SMI's flagship tablet press, the Piccola Classic has been updated with the latest features. 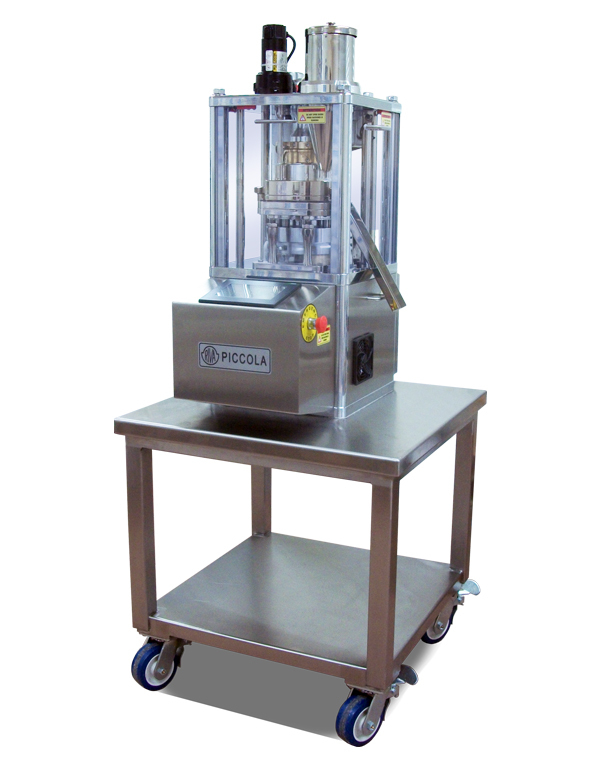 The Piccola Touch yields a 5.5 Ton (55 kN) compression force with a maximum yield of 60,000 tablets per hour. The classic push button panel has been replaced with a new touch-screen HMI, and now runs using Allen Bradley PLC. Ideal for small companies and extremely tight working environments, the small size and weight of the Piccola make it ideal for R&D purposes. SMI's flagship tablet press, the Piccola Classic features a 5.5 Ton (55 kN) compression force with a maximum yield of 60,000 tablets per hour. Ideal for small companies and extremely tight working environments, the small size and weight of the Piccola make it ideal for R&D purposes. Additionally, the compact design allows for a small minimum batch size. Precompression, paddle feeders and turret speeds of up to 100 RPM enable realistic scale up to larger production presses. When paired with "The Director" instrumentation system, the Piccola empowers your development team with a better understanding of the compaction process. Sensors monitoring precompression, main compression, ejection, and take-off forces enable studies that can identiy issues such as sticking, capping, laminating, over lubrication, and strain reate sensitivity (scale-up issues) early in the development process. Its compact design allows for a small minimum batch size. Precompression, paddle feeders and turret speeds of up to 100 RPM enable realistic scale up to larger production presses. The PLC driven Piccola PLC with 6 Ton (55 kN) main and pre compression systes, can produce a maximum of 60,000 tablets per hour. The Piccola PLC is available in standard B or D tooling. The Piccola PLC is controlled through an integrated industrial 15" touch screen computer. The Piccola Bilayer with all the features of a large production press, is essential for early development and scale up production. Designed for R&D, the Piccola Bilayer excels at shortening development time, solving formulation problems and running low volume production runs. The PLC driven Piccola PLC with 6 Ton (55 kN) main and pre compression system, can produce a maximum of 60,000 tablets per hour. The Piccola PLC is available in standard B or D tooling. The Piccola PLC is controlled through an integrated industrial 15" touch screen computer. 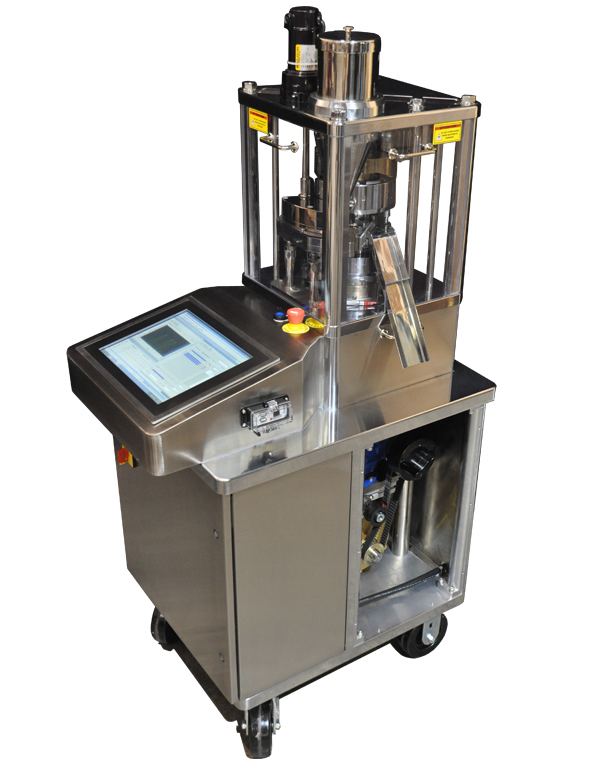 The Piccola PLC with "The Director" instrumentation system will facilitate shortened formulation development times. Detailed analysis of individual compression events enhances the understanding of the compaction process. The Piccola Bilayer can use turret configurations of 'B', 'D' and 'B+D' tooling. When combined with "The Director" instrumentation system, detailed analysis of individual compression events enhance the understanding of the compaction process. This allows the Piccola Bilayer to generate realistic and accurate scale up parameters when merging to a larger rotary press. 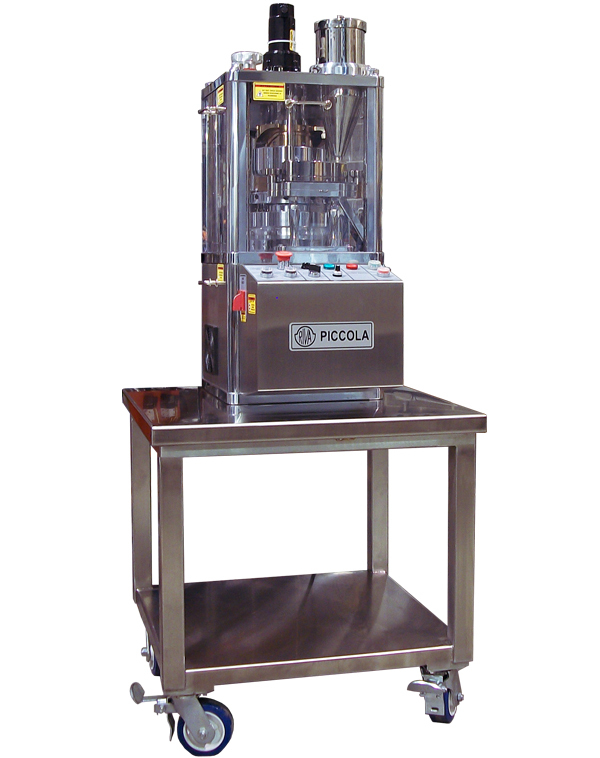 The 30-minute tooling swap time makes the Piccola Bilayer especially attractive when smaller batches are desired. The Piccola Bilayer with "The Director" will generate a compaction study with as little as 300 grams of material. 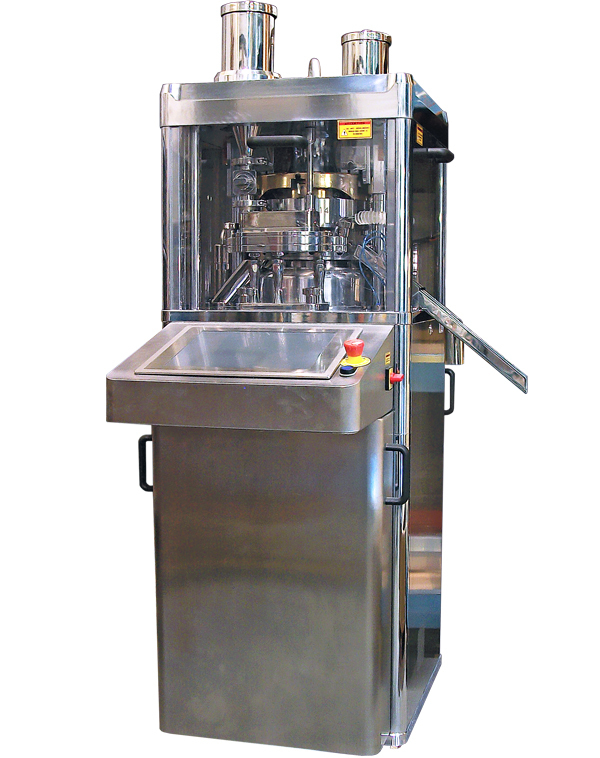 The Compacta II is a fully automated production tablet press. The integrated PLC driven machine is a standalone unit that does not require additional consoles or cabinets. This makes the Compacta II ideal for tight working environments. The Compacta II is designed with the same diameter pre/main compression rollers. This will allow a maximum de-aeration time and equal maximum compression forces. The SMI software production module will maintain weights to user specified tolerances. The tablet rejection system will ensure the collection of high quality compacts. The new optimization mode will automatically adjust the turret speed in conjunction with feeder speed to allow maximum output of tablets while maintaining tolerances. No pre-owned presses are available at this time.